During his storied career at the helm of Taiwan Semiconductor Manufacturing Company, Morris Chang led Taiwan to the top of the world's semiconductor industry. Today, 87-year-old Chang became the first in history to be awarded the Order of Propitious Clouds for his corporate leadership. Chang received the accolade from President Tsai today. President Tsai personally presented the Order of Propitious Clouds to TSMC founder Morris Chang today, as a gift of gratitude for his years of contribution to Taiwan’s high-tech sector. Just last year, TSMC officially became the largest semiconductor company in the world. Through technology, through innovation, and through enthusiasm, Chang let the world see Taiwan. Today in this award ceremony, I want to represent the people of Taiwan in expressing the utmost respect and gratitude to Chang for his important contribution to Taiwan. Chang had insisted on keeping TSMC’s roots in Taiwan. 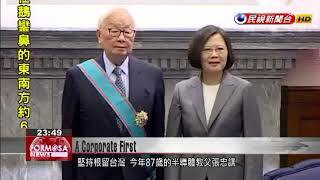 At 87 years old, the “godfather” of Taiwan’s chip sector has become the first industry leader in history to receive the presidential order. I am grateful to the president for giving me such a great honor. Right now TSMC is a very successful company, but it also faces many challenges. But I deeply believe in, and look forward to, the people of TSMC continuing to advance and create new miracles under the new generation of leaders. Premier Lai Ching-te and former Academia Sinica chief Lee Yuan-tseh were both in the audience today as Chang received the honor. At the event, neither the premier nor the president would confirm rumors that Chang has been named Taiwan representative at this year’s Asia-Pacific Economic Cooperation summit.